Read our interview with Steve Franks about this book. This truly fascinating work deals with fundamental theoretical issues regarding the architecture of the grammar, the nature of the Move operation, and the mapping of syntactic structures to morphology and phonology. It makes bold, far-reaching, and thought-provoking proposals backed up by extremely interesting and rich data. This is a book which every syntactician should read and respond to. Pervasive differences among languages are often differences in the way distinct morphological pieces are spelled-out. 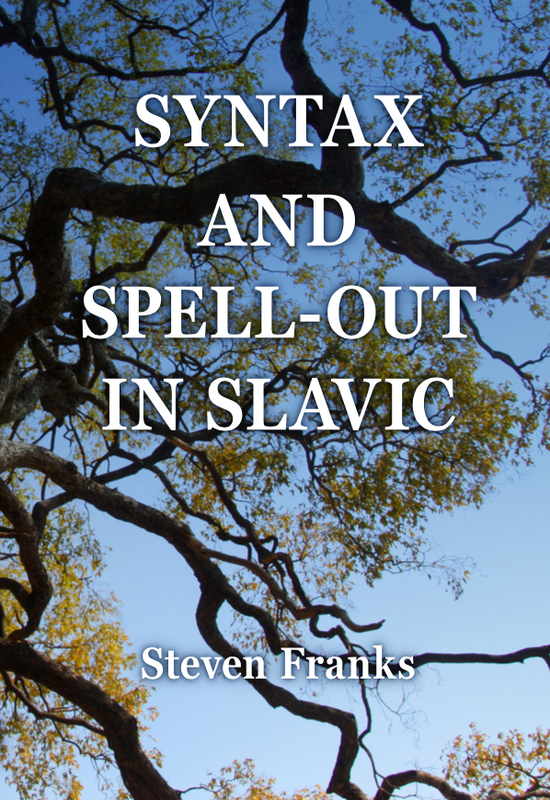 In this volume, empirically rich and theoretically sophisticated as is all of his work, leading linguist Steven Franks brings to bear crucial facts from South Slavic languages to uncover the principles involved in Spell-Out, teasing apart the contributions of syntax and those attributable to morphology and phonology. Compulsory reading for all syntacticians. A very impressive accomplishment by one of the world’s leading Slavic syntacticians. Every syntactician (Slavicist or not) will gain by reading this book, especially for its great insights about the nature of spell-out, and implications for realization of copies. Steven Franks holds degrees from Princeton, UCLA, and Cornell, and has spent the past 30 years teaching Slavic and general linguistics at Indiana University. He has published and lectured widely on diverse areas of Slavic syntax, and is particularly known for his detailed comparative studies of numerals, case phenomena, and clitics. The present volume, although it also relies largely on Slavic data, offers a broader perspective on the workings of syntax. Syntax and Spell-Out in Slavic explores how syntactic structures are mapped into representations manipulable by the morphology and phonology. Leading ideas are that “movement” is best understood as a metaphor for multiattachment and that what ends up pronounced where results from the complex interaction of competing forces and particular derivational steps. These proposals are primarily illustrated by close examination of phenomena drawn from two distinct domains: wh-movement and clitics. The former domain serves to develop the more general theoretical underpinnings of Spell-Out and the latter, by revisiting classic issues in the analysis of Slavic clitics, probes some of the model’s finer complexities.